Transition metal and f element organometallic chemistry; catalysis; vibra¬tional spectroscopy; nuclear magnetic resonance; synthetic facsimiles of metallo¬protein active sites; carcinostatic metal complexes; solid state chemistry and low-dimensional molecular metals; nonlinear optical materials; polymer chemistry; tetrahydroborate coordination chemistry; macrocycle coordination chemistry; laser-induced chemistry and isotope separation; molecular electro-optics; metal-organic chemical vapor deposition; polymerization catalysis; printed flexible electronics; solar energy; transparent conductors. Tobin J. Marks is Vladimir N. Ipatieff Professor of Catalytic Chemistry, Professor of Materials Science and Engineering, and Professor of Applied Physics at Northwestern University, and Distinguished Adjunct Professor at Texas A&M Qatar and at Korea University. 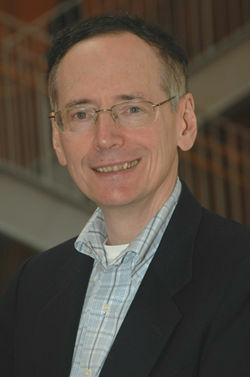 His research interests include transition metal and f element organometallic chemistry; catalysis; vibrational spectroscopy; synthetic facsimiles of metalloprotein active sites; carcinostatic metal complexes; solid state chemistry and low-dimensional molecular metals; nonlinear optical materials; polymer chemistry; tetrahydroborate coordination chemistry; macrocycle coordination chemistry; molecular electro-optics; metal-organic chemical vapor deposition; polymerization catalysis; printed flexible electronics; solar energy; and transparent conductors. Professor Marks has received American Chemical Society National Awards in Polymeric Materials, 1983; Organometallic Chemistry, 1989; Inorganic Chemistry, 1994; Chemistry of Materials, 2001; Distinguished Service in Inorganic Chemistry, 2008; Organic Chemistry/Cope Senior Scholar, 2010; Catalysis (Somorjai), 2013. He received the 2000 American Chemical Society Cotton Medal, 2000; American Chemical Society Willard Gibbs Medal, 2001; N. American Catalysis Society Burwell Award, 2001; American Chemical Society Linus Pauling Medal, 2001; American Institute of Chemists Gold Medal, 2002; German Chemical Society Karl Ziegler Prize, 2003; Royal Society of Chemistry Frankland Medal, 2003; American Chemical Society Bailar Medal, 2005; Principe de Asturias Prize for Scientific Research, 2009; N. American Catalysis Society Pines Award, 2009; 2009 Taylor Materials Research Award, Penn. State U., 2009; 2009 Von Hippel Award, Materials Research Society; 2010 American Chemical Society Nichols Medal; 2010 Distinguished Affiliated Professor Award and Wilhelm Manchot Prize, Technical U. of Munich; 2010 American Chemical Society Mosher Award; 2011 Schulich Prize, Technion-Israel Institute of Technology; 2011 Dreyfus Prize in the Chemical Sciences; 2012 American Chemical Society Richards Medal; 2012 National Academy of Sciences Award in the Chemical Sciences; Distinguished Alumni Award and Election, Circle of Discovery, U. of Maryland, 2012; MacDiarmid Medal, U. of Pennsylvania, 2013; Wilkinson Medal, Royal Society of Chemistry UK, 2014; Sacconi Medal, Italian Chemical Society, 2015; Materials for Industry Award, Royal Society of Chemistry UK, 2015; Einstein Award, Chinese Academy of Sciences, 2016; UCLA Tannas Award, 2016; American Chemical Society Priestley Medal, 2017. 2004 H.B. Jonassen Lecturer, Tulane U. 1995 Lind Lecturer, University of Tennessee- Oak Ridge Nat. Lab. Journal of Inorganic and Nuclear Chemistry; Inorganic Syntheses; Organometallics; Inorganica Chimica Acta; Polyhedron; Polymer; Progress in Inorganic Chemistry; Chemical Communications; Accounts of Chemical Research;Journal of Molecular Catalysis; Topics in Organometallic Chemistry; Catalysis Letters; Actinide and Lanthanide Reviewer for Annual Surveys of Organometallic Chemistry; Topics in Catalysis; Nouveau Journal de Chimie/New Journal of Chemistry; Chemistry of Materials; Advanced Materials, CVD; Oxford Monographs on the Physics and Chemistry of Materials; Crystal Engineering Communications; Proceedings of the National Academy of Sciences; MRS Communications; Organic Photonics and Photovoltaics. Polyera Inc., in Skokie IL (Headquarter laboratories), San Francisco CA (Design center), and Hsinchu Taiwan (Applications center); currently 104 employees. Israel Chemical Society, Honorary Member. Minuteman, Chicago ACS section, 9/71 2000. Organizer, Inorganic Chemistry Symposia, Great Lakes Regional ACS Meeting, 6/76. Symposium Planning Committee, Inorganic Chemistry Division, ACS, 6/77 6/78. Director, NATO Advanced Study Institute, "Organometallics of the f Elements", SOGESTA Conference Center, Urbino, Italy, 1978. Principal Organizer, NSF National Organometallic Chemistry Workshop, 1980 1982. Councillor, Inorganic Chemistry Division, ACS, 1/80 12/85. Member, National Research Council Solid State Sciences Advisory Panel, 1980 1985. Organizer, Lanthanide and Actinide Symposium, 28th IUPAC Congress, Vancouver, 1981. American Chemical Society Tour Speaker, 1981. Organizer, Organometallics of the f Elements Symposium, 15th Rare Earth Research Conference, Rolla, 1981. Organizing Committee, Second China Japan U.S.A. Inorganic and Organometallic Chemistry Conference, Shanghai, 1982. Steering Committee, Gordon Research Conference on Organometallic Chemistry, 1982. Steering Committee, First International Conference on the Chemistry and Technology of the Lanthanides and Actinides, Venice, 1983. Director, NATO Advanced Study Institute, "Fundamental and Technological Aspects of Organo f Ele¬ment Chemistry," Maratea, Italy, 1984. Oversight Review Team, NSF Chemistry Division, 1982. ACS Publications Committee, 1983 1985. Steering Committee, Second International Conference on the Chemistry and Technology of the Lanthanides and Actinides, Lisbon, 1987. Committee on ONR Chemical Sciences Research Planning, 1985-1988. Task Force, ACS Materials Chemistry Journal, 1986. Organizing Committee, NSF Workshop on Materials Preparation Facilities, 1987. Organizing Committee, International Conference on Synthetic Metals '88. Chairman, Gordon Research Conference on Inorganic Chemistry, 1989. Editor, Polyhedron symposium-in-print, "Metal-Ligand Bonding Energetics in Organotransition Metal Compounds",1988. Organizer, "Bond Energies and the Thermodynamics of Organometallic Reactions" Symposium, Fall ACS National Meeting, Miami, 1989. Organizing Committee, Sixth International Symposium on "Relations Between Homogeneous and Heterogeneous Catalysis," Pisa, 1989. Senior Scientist Appointments Committee, Chemistry Division, Argonne National Laboratory, 1988-1992. Instrumentation Advisory Committee, Hong Kong University of Science and Technology, 1989. National Science Foundation Chemistry Advisory Committee, 1990-1992. Organizer, First International Workshop on MOCVD of High-Tc Superconductors and Related Materials, Evanston, 1992. Local Organizer, First NSF Joint U.S.-Russian Inorganic/Organometallic Chemistry Workshop, Evanston, 1993. Organizer, Second International Workshop on MOCVD of High-Tc Superconductors and Related Materials, Tiburon, 1994. American Chemical Society Willard Gibbs Medal Jury, 1994-2000; 2009-2012. Co-Organizer, Third International Workshop on MOCVD of High-Tc Superconductors and Related Materials, Strasbourg, 1996. U.S. Department of Energy-Basic Energy Sciences Council on Chemical Sciences, 1996-2001; Chair, 1999-2001. Task Force, ACS Review of Inorganic Chemistry, 1996-1997. Organizing Committee, NSF Solid State Chemistry and Materials Workshop, 1998. Committee of Visitors Review Team, NSF Chemistry Division, 1998 Editor Search Committee, Organic Letters, 1998. Technology Vision 2020 Catalysis Report Team, ACS, CMA, AICHE, CCR, SOCMA. Organizer, U.S. Department of Energy-Basic Energy Sciences International Workshop on Opportunities for Catalysis in Carbon Management, Santa Fe, 1999. National Research Council Board on Chemical Sciences and Technology, 2000-2003. Editor Search Committee, ACS journal Inorganic Chemistry, 2000. Co-Organizer, National Academy of Sciences/National Research Council Workshop “Carbon Management: Implications for R&D in the Chemical Sciences,” December 2000. Assessment Panel, University Grants Committee, Hong Kong, 2001. ACS Task Force on Guidelines for Editor Search Committees. Organizing Committee for Materials and Manufacturing Workshop, National Research Council Committee on Challenges for the Chemical Sciences in the 21st Century, Washington, June 2001. Lecturer, ACS Short Course on Inorganic Polymers, 1987-2003. Editor Search Committee, ACS journal Journal of Organic Chemistry, 2001. Organizer, U.S. Department of Energy-Basic Energy Sciences Workshop “Frontiers in Homogeneous Catalysis”, O’Hare, Sept. 2002. Organizer, 11th International Symposium on Relations Between Homogeneous and Heterogeneous Catalysis, Evanston, July 2003. Assessment Panel, University Grants Committee, Hong Kong, 2004.
Review Committee Chair, Lawrence Berkeley National Laboratory, Feb. 2005. Co-Organizer, ACS-IEEE-MRS Symposium on Organic Microelectronics, Newport, Rhode Island, 2005. Co-Organizer, International Conferences on Transparent Conducting Oxides, Heriklon, 2006, 2008, 2010. Co-author, U.S. Department of Energy-Basic Energy Sciences Report, Directing Matter and Energy: Five Challenges for Science and the Imagination, 2008. Co-author, ONR/NSF report, Hybrid Flexible Electronics Research in Europe, 2009 Review Committee, Lawrence Berkeley National Laboratory, March 2010. Co-author & NSF Coordinator, Five-Nation “Chemical Sciences and Society Symposium” report, Chemistry for a Sustainable Global Society, RSC Publications, 2010. Council on Higher Education Review Committee on Israeli Chemistry Curricula, 2011. Organizing Committee, NAS Award for Initiatives in Research (Young Scientist Award), 2012 Co-author, NSF-ONR report Organic Photovoltaics-Current Status and Opportunities, 2013. NSF Chemistry Division Director Search Committee, 2015.